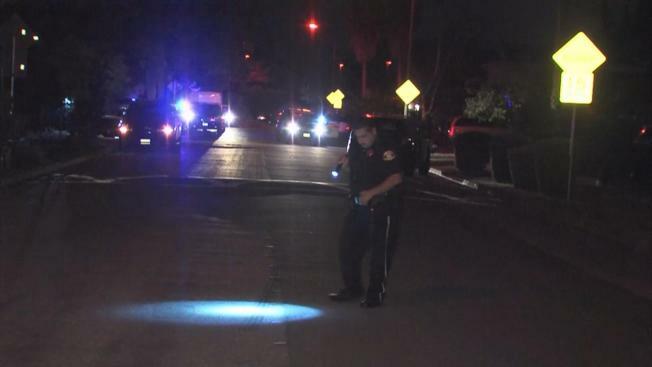 Police investigate a double shooting in San Jose (August 28, 2016). Two victims were shot in the parking lot of a supermarket early Sunday in downtown San Jose, police said. The double shooting occurred shortly after midnight in the Mi Pueblo Food Center parking lot on 235 E Julian Street. Two couples were reportedly drinking in the parking lot when they were approached by two men from a nearby car. The two suspects opened fire, injuring the two men, police said. One victim was dropped off at O'Connor Hospital shortly after the shooting, while the other victim was reportedly found eight miles from the original crime scene walking throughout a neighborhood and knocking on doors clamoring for help, police said. Law enforcement officials located the second victim near La Honda Avenue and Casa View Drive, police said. Both victims are being treated for non-life threatening injuries, police said. The two suspects have not been identified or located, police said.